A year after Sri Lanka's worst natural disaster, many victims of the tsunami languish in makeshift shelters while an inefficient government bureaucracy and the country's poor utilisation of foreign aid continues to compound the crisis. Experts reckon that at the current rate, it will take at least four years for all the tsunami survivors in the country to be rehabilitated. 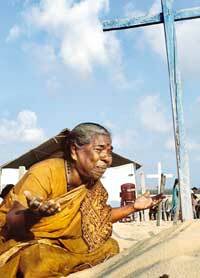 More than 35,000 Sri Lankans lost their lives in the December 26, 2005 tsunami, while 21,441 others were injured. According to government figures, close to a million people were displaced and more than two-thirds of the country's coastline and 13 districts were affected. Some 150,000 people lost their source of livelihood. "Social disparities will be a major challenge in the coming years," notes Yu Hwa Li, national director of World Vision Lanka, one of the biggest ngos involved in post-tsunami work. "Less than 20 per cent of those affected by the calamity have been given new houses," he explains, and then adds, "some survivors have received more expensive houses than the others." Another ngo representative, who declined to be named, complained that only 5 per cent of the tsunami-affected people in the ethnic conflict-affected northern parts of the country have been given houses. The per unit construction cost of houses for tsunami survivors range between Sri Lankan Rs 20,000 (us $2,000) and Sri Lankan Rs 1million -- this when houses for victims of the ethnic conflict costs around Sri Lankan Rs 40,000. In fact, in a housing scheme designed by the Japanese architect Shigeru Ban, the per unit cost of construction came to more than a million Sri Lankan -- only when the project was nearing completion did its sponsors realise that they could have negotiated for cheaper building material and reduced labour costs. Political strife "President Mahinda Rajapakse should put post-tsunami relief work on a war footing. It must be completed within the next six months," says Omalpe Sobitho, a Buddhist-monk parliamentarian of the National Heritage Party (jhu). But it's not just the pace of rehabilitation work that has attracted the ire of Sobitho's party. It had earlier joined hands with the People's Liberation Party to petition the Sri Lankan Supreme Court against the cooperation mechanism chalked out by the government and the separatist Liberation Tigers of Tamil Eelam (ltte) for the ethnic-strife hit northeast. The court had agreed with the petitioners and had directed that the reconstruction efforts for the strife-torn region should be directed from an undisturbed town -- and not the lttte- controlled Kilinochchiwhee. Omalpe also complains that " ngos and foreign donors have provided a lot of funds to the ltte, but the separatist group has done no rehabilitation work in the areas it controls". "That apart, the government could have at least proceeded with rehabilitation work in areas under its control," says a jhu spokesperson. New government, new excuses The relief efforts were reorganised in November 2005 after new government headed by Mahinda Rajapakse assumed power in Sri Lanka. A new Reconstruction and Development Authority (rda) has come up. A draft report of the agency notes that some 4,300 new houses have been completed and another 10,700 units are under construction, but rda officials reckon that it would take three to five years to complete the reconstruction and rehabilitation work, including providing livelihoods. The government estimates that long-term recovery would cost its exchequer at least us $2.2 billion. I nternational donors have pledged most of this amount, but the government says that it has received only us $600 million, so far. Sirimal Abeyratne, a senior economist at Colombo University, rubbishes this excuse: "Sri Lanka's appalling levels of foreign aid utilisation is the main cause for bottlenecks in aid flows for reconstruction. The country's aid utilisation rate is less than half that of the internationally accepted 25 per cent of the funds donated in a year." Ravi Karunanayake, Sri Lanka's former commerce minister, says that the increased aid flows have had only one major benefit: they have been used to stabilise the country's currency which was under severe pressure from the us dollar in early 2005. Meanwhile, the new government has left no stone unturned in blaming its predecessor for all the shortfalls. Its spokesperson attributed the delays in providing houses to the Chandrika Kumaratunga regime's political incompetence, shortage of land to resettle victims and a botched attempt to enforce a buffer zone 100 metre to 200 metre from the country's shoreline where no construction will take place. The buffer zone restrictions were relaxed after the new regime took over. The government's spokesperson also chided the Kumaratunga regime's failure to enunciate a more effective environmental protection strategy. "The impact of the tsunami was limited where sand dunes, coral and mangroves were maintained, but our predecessor took little cue from this phenomenon," he said. The bureaucracy has become everybody's whipping boy. Karunanayake excoriates it for the slow pace of reconstruction work under the earlier regime. "Even a year after the tragedy, things are moving at a snail's pace," he says. The media has focussed much attention to the government-organised relief work, but it has done little to track ngo efforts. This is a major omission. After all ngo and private donations has amounted close to $1 billion. But financial implications are not all that's there to ngo efforts. The issues involved coordination between different ngos, the synchronisation of their efforts with that of the government, and most importantly, the accountability of some of these organisations. At least a thousand new ngo s surfaced in Sri Lanka after the December 26, 2005, calamity. Some of them shut shop within a few months, citing paucity of funds as a reason for winding up operations. Coordination between ngos is another problem area. Hwa Li believes that the problem was compounded when numerous ngo s sprouted up after the calamity. "Many of the genuine victims did not get financial relief while others who were not affected got monthly payments," he says.